Ken is looking for the PINK version of this duck/platypus. I’m looking for a 13 inch long very soft lying down pink curly duck / platypus. 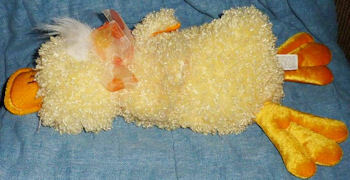 Doing some searching, we believe she was a Chosun International duck since it looked exactly like this yellow one, although with 8 years of loving and comfort obviously showing we can’t be sure. While our 8 year old daughter Ella was staying with her grandparents at a hotel, she lost her pink duck (named, of course Pink Duck) that she has had since she was born, and who has been a companion to Blue Duck all that time as well. We have lost hope of it being found in the hotel, figuring either it got dropped in the hallway and has a new home, or got mixed up with some stuff and thrown in the trash. She has slept with these ducks pretty much every night for 8 years and is heartbroken about Pink being gone. It won’t be the same, but we are hoping to find a new one to replace the old Pink. We can’t find any current ones for sale at stores online yet and will keep an eye on eBay if one happens to show up, but any help finding one sooner rather than later is definitely appreciated. Either way, thank you for the wonderful service you provide! I just found a pink chosun Platypus this week. I will aim to get it listed on ebay this week. I hope this item helps your family!!!! Thanks, Karen. That’s not the one Ken needs, but #15787 is looking for that one. I’ve sent the link. I don’t need a pink duck right at the moment. Do you accept plush donations, no strings, I would pay postage, because I know you do so much good, you could sell them or anything, just when I get around to it and some of our plush need love.